Robert Silverberg Novels from the most prolific period in his career. Robert Silverberg has become my favorite old school SF writer and I have read 6 books during his most prolific period of 1967-1976, beginning with A Time of Changes, Downward to the Earth, Tower of Glass, To Open the Sky, The Man in the Maze, and Nightwings. Nightwings is a short, mournful novel that follows the wanderings of a member of the Watcher’s Guild as he looks to the stars in anticipation of a foretold alien invasion of Earth. His companions include a beautiful young ‘Flyer’ (the “Nightwings” of the title) and an enigmatic Changeling. During his journey, this Watcher sees the devastation caused by the invaders as he is trying to figure out his new role now that Earth has turned into an alien tourist attraction. 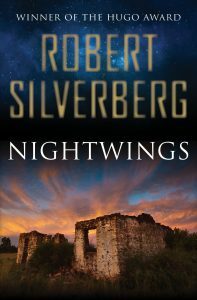 Similar to Downward to the Earth, Nightwings presents a spiritual journey in the novel and Silverberg explores with the concepts of sin and redemption quite well. However, I will admit I did not connect to the Watcher character of this novel like I did with the main character in Downward to the Earth. Nightwings is my least favorite of the six Silverberg novels I have read from his most prolific period. But, Silverberg knows how to tell a story and present thought-provoking ideas as well as anyone in the genre.